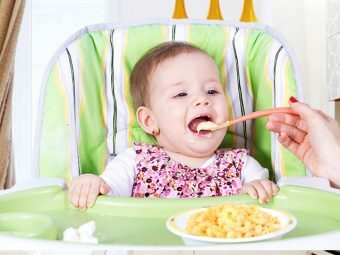 How Much Should a 6-Month-Old Eat? My baby is turning six months in a couple of days. So, it is time for her to enjoy solids. It is an exciting phase but builds anxiety too as I do not know if she would like to eat solids or accept anything else in the place of breast milk. According to the American Academy of Pediatrics (AAP), six-month-olds should have a combination of breast milk and solid foods. So, the secret is to put in some extra effort to strike a balance between the two. Want to know a few more secrets? MomJunction comes up with some simple food ideas for a six-month baby. The first foods offered to a baby are called stage 1 baby food. They are pureed and strained so that the little ones can gulp and digest them easily. They are low on allergy grade. However, consult a pediatrician before introducing any new food to your little one. Continue breast milk or formula for your baby as it is the main source of nutrition for babies until one year (1). Breastfeed every two to three hours or on demand. Alternatively, offer 24-37 ounces of formula milk every day. Apples, avocados, apricots, bananas, mango, nectarines, peaches, papaya, pears, plums, prunes, chikoo, pumpkin and kiwi pulp make great first foods for a baby. 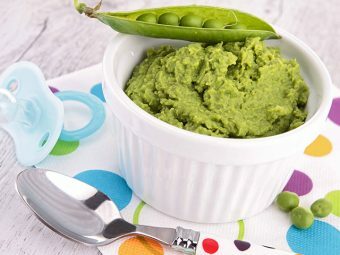 Babies can digest boiled and mashed vegetables such as beans (green), carrots, sweet potato, squash, green peas, and potatoes. Give boiled and cooled water to your baby at least thrice a day. Cereals and pulses such as rice, barley, oats, mung and lentils provide essential nutrients like proteins and minerals to the growing babies. You can add pureed and stewed poultry, and fish (less in mercury) to your baby’s diet. Ensure to remove bones while serving these foods. Confused what to give and when? Write down the baby’s feeding schedule and pin it up to make things easier for you. Formula or breast milk. Continue breastfeeding for the rest of the day. Remember that you are preparing the chart for your reference only. You need not have to stick to a schedule strictly. Offer milk and solids in an order that is convenient to you and acceptable to your baby. However, make food so tasty that your baby would not mind eating it at any time of the day. 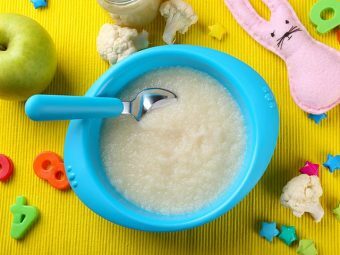 Try these baby food recipes for your 6-month-old and let him taste the yummy and nutritious meals. Boil the ingredients in a saucepan. Then cook in simmer for 15 minutes. Transfer the contents into a blender and blend well. Add in more juice to get thinner consistency or add cereal to thicken it up. Boil the apple slices in a saucepan. The slices need to immerse in water. Once done, mash the apple slices. Add water to get the desired consistency. Blend the banana in a food processor or mash in a bowl. Heat the mashed content for 25 seconds for added softness. Add milk or water to make it thinner or cereal to thicken it. Add in breast milk or formula milk to achieve desired consistency. Wash the rice and cook it in a saucepan or pressure cooker. Mash the cooked rice and add formula or breast milk. Boil water in a saucepan and add barley. Cook in simmer for 10 minutes. Add apple slices and cook on low heat for two minutes. Puree the contents using a hand blender. Take a saucepan, add water and bring it to boil. Add oats and cook in simmer for 10 minutes. Once done, add bananas and mash well. Add formula or breast milk to get the desired consistency. Spread butter on the cored apple and put it in a pan containing water. Preheat the oven to 400°F and place the pan in it. Bake the apple for 30 minutes. After baking, mash the apples to desired consistency. Scoop out the seeds from the sugar pumpkin halves and drain the pumpkins with water in a baking pan. Bake for 40 minutes in the oven preheated to 400°F. Once the halves turn soft, scoop the squash meat and puree it in a food processor. Add water to achieve a smooth consistency. Transfer the beans into a pan and place it in a steamer basket. Steam until tender. Keep a check on the water level. Once done, puree the contents in a blender and bring it to a smooth consistency. Transfer the carrot slices into a steamer pan containing water. Steam until the carrots turn tender. Place the contents into a blender and puree them. Add water if needed. Add all the ingredients to a pan and add enough water. Cook until tender and puree the contents in a blender. Add water to get the desired consistency. With such interesting recipes, it is likely that your baby would love her new diet. But you cannot feed her beyond small quantities just because she has developed a liking for it. Start with servings of 5-10ml or one teaspoon and increase the amounts gradually (2). The baby may eat just half a spoon initially. Do not force-feed her. Also, moving to solids is not an easy task as you need to be careful not to choke the baby or hurt her tummy with heavy foods. 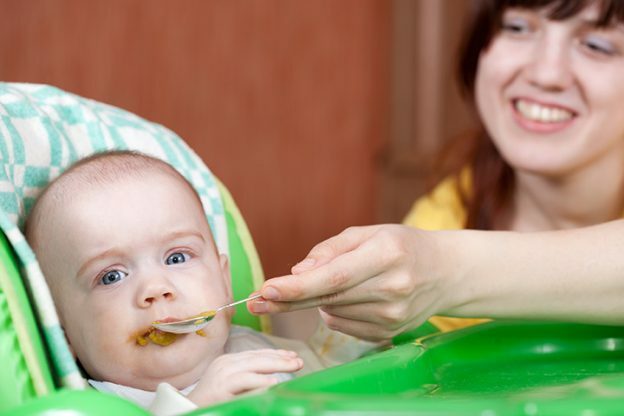 Take enough care not to harm the baby when you are feeding solids. Do not give cow milk to babies under one year. Also avoid honey, since it may contain spores that cause botulism. Never give slices of fruit or other finger foods for 6-month-old because, it could cause choking. Introduce one fruit at a time and check for any allergic reactions. Follow a four-day-wait rule in between two new foods. Feed your baby in a calm and pleasant environment. Prepare baby food in steel or glass containers. Say no to plastic containers, even if they are food-grade. Offer water in a sterile glass or steel cup, but not in a sipper or feeding bottle. Avoid biscuits as they contain refined flour, preservatives, and added sugar. Wash your hands before feeding your little one. Introduce your baby to healthy foods so that he can develop a liking for them. Begin with easily digestible foods such as cereals, fruits, and veggies. Engage her with rhymes or soft music when she is eating. What is your baby’s favorite recipe? Let us know in the comments section. 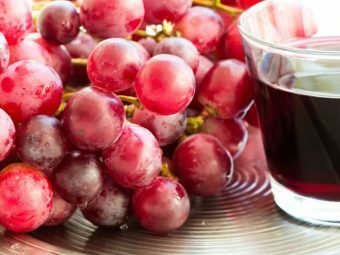 Is It Good To Feed Your Baby Grape Juice?